Ford's F series led the profit parade with more than $50 billion since 1990. Bernstein Research's 12 most profitable vehicles since 1990. What are the most profitable vehicles of modern times? Veteran analyst Max Warburton and his team at BernsteinResearch in London came up with a list of the top global money-spinners since 1990. Warburton said the big winners combined high prices, huge volume and long periods of production that spread development costs over a long period. He found three categories of cash cows: Japanese mid-sized sedans; German luxury cars; and, most lucrative of all, American full-sized pickups. The Japanese sedans had the toughest road to fat profits because of their modest price points. Only the Honda Accord and Toyota Camry generated enough volume to make Bernstein's list of the top 12. The German vehicles on the list were the BMW 5 and 3 series, Mercedes-Benz S class and E class and Porsche 911. 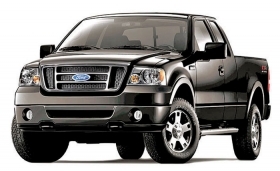 But the really big-buck vehicles were American full-sized pickups with their huge volume. The Ford F series, Chevrolet Silverado/GMC Sierra and Dodge Ram swept the top three spots and generated $108 billion in before-tax earnings since 1990 -- about the same profit as the next nine models combined.